Out of the Box Inc. The game comes with 16 plastic ninjas, what else do I have to say? It’s a fun, pick up and play game that doesn’t require too much time commitment. Quite entertaining for a few rounds no matter your skill level. “A stealthy game of swords and rewards” for two players. What you get in the box is a game board, two four-sided dice, rules and 16 plastic ninjas. There are two sides: red and black. Each side has six regular ninjas, a ninja master and a shadow ninja. The board is divided into three zones: the red dojo, the black dojo and the grey neutral zone between them. Along each side of the board, each player has a “shadow track” and a “scoring track”. All of the ninja pieces are solid plastic and look nice. The four-sided dice have swords through them, which is a nice touch. The board is solid and good quality.To begin, the regular ninjas are arranged in their dojo according to the arrow pattern printed on the board. Each ninja master is placed at the start of their scoring track and the shadow ninja is placed at the start of their shadow track. Players role to go first and take turns after that. A turn consists of rolling both dice and moving one regular ninja that many spaces on the board. Ninjas can move in fairly limited ways. They can either move in a straight line, or an L-shape. If they are in the opposing dojo then they may also double back in order to return to their dojo. The path followed by the ninja must be clear of all other ninjas. If a ninja’s move ends on a square occupied by an opposing ninja, the opposing ninja is killed and removed from the game. This doesn’t score any points, though. Points are scored by going on “missions”. If a ninja leaves his home dojo, he is considered to be on a mission. A ninja on a mission must return to his home dojo within three total turns, or he is eliminated and removed from the game. When a ninja enters the opposing dojo, the shadow ninja is moved along the shadow track according to how deeply the ninja penetrates the dojo. If he makes it three squares in to the dojo, the shadow ninja moves to 3 on the shadow track. If the ninja safely returns to his dojo within the three turns allowed for a mission, that player scores the number of points represented by the shadow ninja. The ninja master moves ahead that many points on the scoring track and the shadow ninja moves back to the start of the shadow track. The game ends when one player scores seven points, or a player runs out of ninjas. There’s a fair amount of strategy for such a simple game. My wife and I took different tacks. Her strategy was very aggressive, based on starting as many missions as possible and trying to eliminate my ninjas. I took a more reactive strategy, waiting for her to commit to a mission before starting one of my own and hoping to get points while she was distracted. The more you play, the more you start to appreciate the different options you have in terms of defending your dojo, suicide missions and blocking the paths that your opponent wants to take. Games go by quickly, around 10-15 minutes per round, so it’s a good “pick up and play” game. It’s an attractive, well put together package, and what game couldn’t be improved with the addition of plastic ninjas? The dice look cool, but are a little awkward to roll. It’s a very simple game that should appeal to kids and adults, but it may not hold adult interest in the long run. 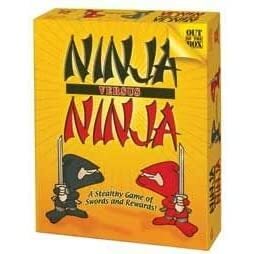 Ninja vs Ninja is a fun, quick-playing game that gets some good mileage out of the ninja theme. It’s a good beer and pretzels game for a couple as each game is short enough that you don’t have to commit a huge period of time. It’s also a good game for gamers and non-gamers to share because it’s easy to pick up, but has a little bit of strategic depth to it. There’s a fair degree of chance as well, so a good strategy won’t necessarily dominate the game.